There is an ultimate measuring stick in the world of soccer to determine which club truly is the best in the world: the treble. For those unfamiliar with this term, it means this: winning the domestic league, domestic cup and continental tournament. In the case of Bayern Munich this season it was the German Bundesliga, clinched weeks ago, the UEFA Champions League, won against Borussia Dortmund, and yesterday's German DFB Pokal. In recent times, only Barcelona have achieved this back in 2009, when Guardiola took Messi and company to the heights of all the different competitions and outclassed teams like Real Madrid and Manchester United along the way. Bayern Munich achieved the same this past season, completely demolishing domestic competition like Dortmund, Shalke 04, Stuttgart and Wolfsburg, as well as European giants Manchester United and Real Madrid in the Champions League. Munich won the first ever German treble through a mix of rigorous and innovative training, and a rich tradition. In fact, they are a model for the Bundesliga itself, which is quickly becoming the top league in the world due to its inherent competitiveness and breakthroughs in marketing achieved by following American sports coverage. The Bundesliga is number one in the world in attendance, is majority-controlled by German investors and, unlike most leagues, collectively makes a profit. The addition of players to the Bayern Munich squad, such as Mandzukic and David Alaba, have allowed for growth and efficacy in multiple positions. That Mario Gomez is on his way out does not mean Bayern is in a losing position, since they will be acquiring players like Lewandowski from Dortmund. And yes, one cannot forget the true heroes of Bayern Munich: Arjen Robben, Franck Ribery, Thomas Muller, Philip Lamm, which are the backbone of its prodigious attack. One only needs to see their third goal in the Cup final yesterday. Lamm overlap with Muller and a perfect center of death to a surging Mario Gomez. 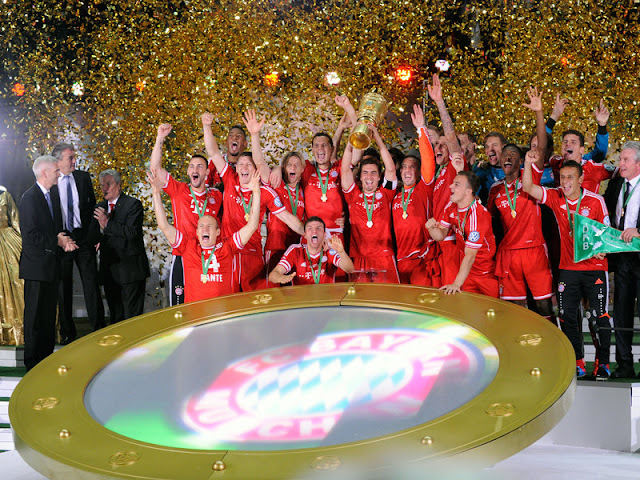 Gomez made no mistake and Munich was on the verge of clinching their treble. Bayern Munich is an exciting club that has gone largely unnoticed by the wider world of soccer, not by the true follower, but by wider international media and those that consider the Premier League, Serie A and Spanish La Liga the only tournaments worth watching. It is not for lack of star power that Bayern Munich is behind Barcelona or AC Milan in the world's eye. It's the significant capital that goes into overstuffed teams in the Premier League or two-horse races like the one we see in Spain every year. It's time for us to enjoy and celebrate the best team in the world for what it is: class, inventiveness, coolly calculated German plays and pure soccer. Bayern Munich dazzles us with Robben's deft touches, Boateng's energy and commitment, Muller's speed and tenacity, the two Mario's effectiveness in front of goal and a collective mentality of victory.